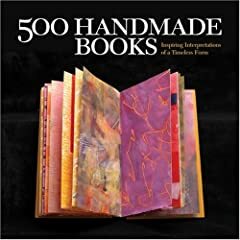 Lark Books has just published 500 Handmade Books: Inspiring Interpretations of a Timeless Form (500 Series) . Part of their 500 series, it is a visual exploration of the form. After a brief introduction by juror Steve Miller, page after page of photographs follow. As with any book exhibition (except ones where you are allowed to handle the work), there is a certain frustration in not being able to see more pages and examine the books more closely, but that does not take away from the stunning and inspiring presentation. I am honored to have three of the Spirit Books included. Congratulations! I've really liked what I seen of this series thus far. Are you an Amazon partner (or whatever they call it) You should think about having the book image link to the Amazon page, so people can purchase. Have seen. What I HAVE seen. Thanks for the suggestion Lynne. I have added the link to amazon.